A 68-year-old woman was admitted because of severe abdominal distention with tenderness. 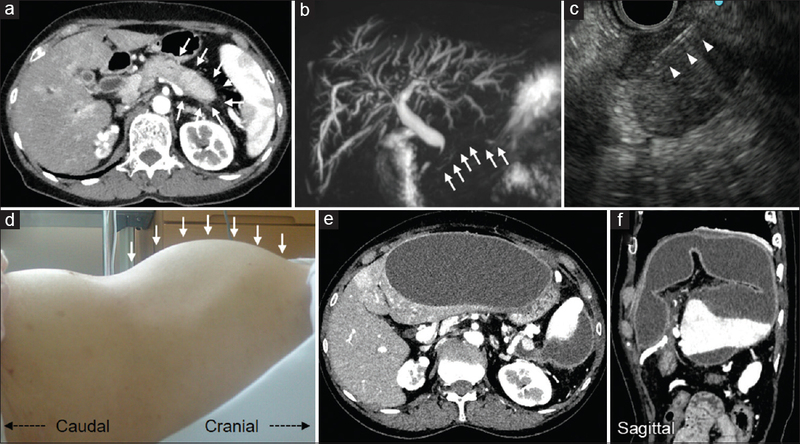 Two months ago, a diffuse enlarged pancreas with rim-like enhancement [[Figure 1]a, white arrows] and irregular narrowing of the main pancreatic duct [Figure 1]b, white arrows] were detected by computed tomography (CT) and magnetic resonance cholangiopancreatography, respectively. EUS-FNA of the pancreatic tail was performed with a transgastric approach using a 19-gauge needle [[Figure 1]c, white arrowheads]. She was diagnosed as having autoimmune pancreatitis (AIP). Oral prednisolone therapy (30 mg daily) was started followed by tapering every 2 or 4 weeks. Two months after EUS-FNA, she was admitted again with the aforementioned symptoms. The upper abdomen was severely distended [[Figure 1]d, white arrows]. 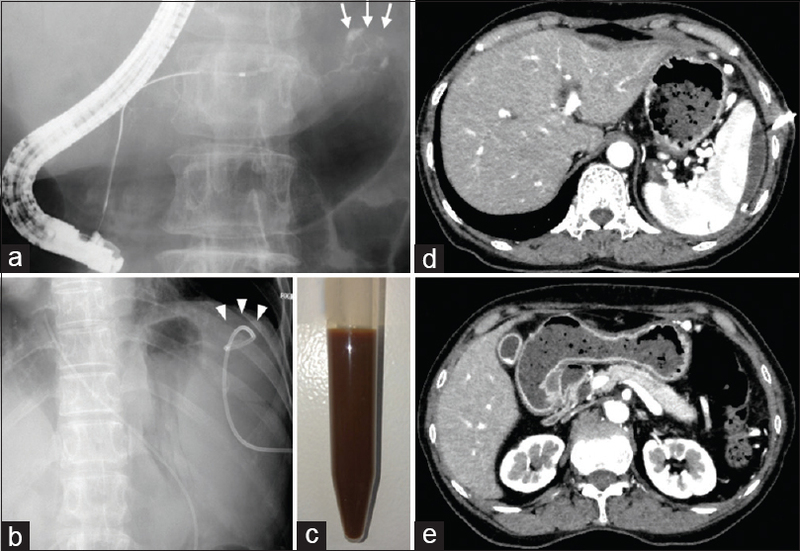 The CT scan revealed extremely large fluid collection from around the spleen to the anterior left lobe of the liver [Figure 1]e and [Figure 1]f. Endoscopic retrograde pancreatography showed suspicious contrast leakage from the tail of the pancreatic duct [[Figure 2]a, white arrows]. Then, endoscopic nasopancreatic drainage was performed. One week later, we performed ultrasound-guided percutaneous drainage with a retroperitoneal approach [[Figure 2]b, white arrowheads] because the fluid spread retroperitoneally to the anterior left lobe of the liver. The fluid was chocolate colored with extremely high amylase level [Figure 2]c. The fluid almost disappeared [Figure 2]d and [Figure 2]e within 1 week. Four months after percutaneous drainage, the follow-up CT scan revealed no recurrence with steroid maintenance therapy (5 mg daily). EUS-FNA is generally considered a safe procedure., We experienced delayed pancreatic ductal leakage after EUS-FNA for AIP. Some patients with pseudocysts associated with AIP who respond to steroids have been reported. Heo et al. reported a case of pancreatic ascites, pancreatic ductal leakage, and multiple pseudocysts with AIP; the ascites with pseudocyst improved with corticosteroid therapy and endoscopic transpapillary stenting of the main pancreatic duct. Although our patient was taking adequate prednisolone orally, fluid collection gradually increased within 2 months after EUS-FNA. Delayed pancreatic ductal leakage may be affected by delayed wound healing with steroid therapy, resolution of swelling, and weakness of the pancreatic duct with active inflammation due to AIP. Physicians should consider delayed pancreatic ductal leakage after EUS-FNA in patients with AIP receiving steroid therapy. The authors would like to thank the participating patient. Wang KX, Ben QW, Jin ZD, et al. Assessment of morbidity and mortality associated with EUS-guided FNA: A systematic review. Gastrointest Endosc 2011;73:283-90. Eloubeidi MA, Tamhane A, Varadarajulu S, et al. Frequency of major complications after EUS-guided FNA of solid pancreatic masses: A prospective evaluation. Gastrointest Endosc 2006;63:622-9. Muraki T, Hamano H, Ochi Y, et al. Corticosteroid-responsive pancreatic cyst found in autoimmune pancreatitis. J Gastroenterol 2005;40:761-6. Heo WG, Kim TH, Kim YJ, et al. Autoimmune pancreatitis complicated with pancreatic ascites, pancreatic ductal leakage, and multiple pseudocyst. Pancreas 2017;46:e10-11.